High Holy Days, Twice Over: When Jewish and Hindu feasts coincide. Cambridge, MA. It is more than enough of an opportunity for those of us who are Christian to be mindful during the next days that Jews are observing a series of most intense and varied holy days — from last night (September 24, Rosh Hashanah year 5775) to Yom Kippur (October 3), the day of Atonement. We ordinarily do not note or notice the holy days of another religion, but the deep connections of Jewish and Christian traditions should give us pause and slow us down in the next days, so that we see our ordinary lives differently, with a renewed sense of what God promises us, and a deepened sense of repentance for the possibilities we have missed. Certainly, our Jewish neighbors are reminding us that starting over and repenting for our sins are not once a year events, but right-now possibilities for us. But there is more. 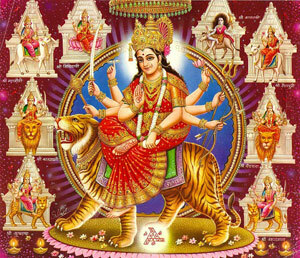 Today (September 25) also marks the beginning of Navaratri, the nine days of the fall harvest festival marked by very many Hindus, with a mix of celebration and fasting that culminate in special worship of the goddess Durga (October 3), as she triumphs over a great demon who in myth takes the form of a buffalo. It is a festival of the harvest, and a time to worship the Goddess. For us who are Christian, it is an early reminder of harvest as a time of thanksgiving, and an opportunity, in our bloody and violent, violated world, to recognize how God turns evil back into good. That so many of our neighbors — Jews and Hindus — are right now in the midst of a holy season invites us to recognize and glimpse again the holiness of days that seem to us so ordinary. We can with Jews mark the freshness of the year, and regret our straying and errors; with Hindus, we can give thanks for the bountifulness of divine gifts year after year, and the eventual, sure divine triumph over evil. But most basically, by this convergence of Jewish and Hindu holy days, we are invited and challenged to put aside a purely secular notion of time, in favor of a richer sense of multiple calendars and multiple markings of the divine. Time is uneven, varied, and never quite what suits our own calendar of events. So in the end, our time too — even if it is not Jewish, not Hindu — is made holy, holier, by the sacred days upon which we have now embarked. In our own way, our own ordinary days too are holy, thanks in part to the piety and celebrations of our Jewish and Hindu sisters and brothers.